Added the review by Review by Les Numeriques to my Best Reviewed Flicker Free 144hz 1440p Monitors buying guide. Fully adjustable matte 2560x1440 144hz AUO TN panel with Nvidia G-Sync, Displayport, HDMI 2.0 and 3.5mm Audio Out. I don't know what type of matte coating it uses or if it suffers from the same dark scene banding as the Dell S2417DG or S2716DG, and it has very poor preset color accuracy and washed out colors thanks to the average 1.8 preset gamma. Not recommended. Added the Review by IT Hardware Poland to my Best Reviewed Flicker Free 24-25" 1080p IPS/PLS Monitors buying guide. Fully adjustable matte 1920x1080 IPS with Displayport, HDMI, 2x 2W speakers, VGA, and 3.5mm Audio In & Out. The iiyama can't fully cover the sRGB color space (87.6% coverage) and has low preset gamma resulting in very washed out colors. Added the Review by PRAD to my Best Reviewed Flicker Free 24-25" 1080p IPS/PLS Monitors buying guide. Fully adjustable matte 1920x1080 IPS with a perceived black depth increasing matte grey bezel, Displayport, HDMI, 4x USB 2.0 (side, 2x USB 3.0 (back() and 3.5mm Audio Out & Microphone In (side). The LG is fairly accurate, but can't fully cover the sRGB color space (90% out of the box versus 95% for the best 24-25" IPS/PLS) and has slightly too low preset gamma. Added the Measurements by Belgium Hardware to my Best Reviewed Flicker Free 27" 1080p IPS/PLS Monitors and Best Reviewed Flicker Free 144hz 1080p Monitors buying guides. Added the Review by PRAD to my Best Reviewed Flicker Free 27" 1440p AHVA/IPS/PLS buying guide. Matte, fully wide gamut and fully adjustable 2560x1440 resolution LG AH-IPS panel with a built in colorimeter, Displayport, Dual-Link DVI, HDMI, USB-C, 2x USB 2.0 (back), 2x USB 3.0 (side) and a 16 bit 3D LUT. The Eizo has very accurate color presets aside from the DCI-P3 mode which has very high, 2.6 preset gamma which causes black crush, but it is important to note that the point of monitors like the CG279X is to be hardware calibrated with an accurate colorimeter, and used for work with programs which support color management. The Eizo has slow pixel response times, but fairly low input lag (9ms) for a professional display. Added the Review by PC Lab PL to my Best Reviewed Flicker Free 27" 4-5K AHVA/IPS/PLS buying guide. Added the Review by Playwares and the Review by Tom's Hardware to my Best Reviewed Flicker Free 27" 4-5K AHVA/IPS/PLS buying guide. Very accurate matte 3840x2160 AH-IPS in a fake frame-less casing with a fully adjustable stand, Displayport, mini-Displayport, HDMI 2.0, 4x USB 3.0 Downstream, 2x USB 3.0 Upstream and a 3.5mm Audio Out. It has an HDR emulation mode, but lacks a wide gamut panel required to properly support HDR. Review by Alexander Grain (=DEAD=) to my Best Reviewed Flicker Free 27" 1440p AHVA/IPS/PLS buying guide. Fully adjustable, matte, 2560x1440 IPS with Displayport In & Out (for Daisy Chaining), HDMI, 4x USB 3.0, USB-C, 3.5mm Audio OUt and accurate out-of-the-box color accuracy in the default Standard mode. Added the Review by Trusted Reviews to my Best Reviewed Flicker Free 32" 4K AHVA/IPS/PLS buying guide. Matte 4K VA panel with wide gamut HDR panel, HDR 600 certification, very accurate color presets, a high quality sRGB mode which does not under-saturate colors and high (28ms) input lag. It has a matte black bezel (superior to glossy black but still decreases the perceived black depth compared grey bezels), a fully adjustable stand, Displayport, 2x HDMI 2.0, USB-C, 3.5mm Audio Out, 4x USB 3.0 and RJ-45 Ethernet power port. Added the Review by PC Magazine to my Best Reviewed Flicker Free 27" 4-5K AHVA/IPS/PLS buying guide. Fully adjustable and very accurate matte 4K IPS panel with hardware calibration. It has Displayport, 2x HDMI 2.0, 4x USB 3.0 and a 3.5mm Audio Out. Set the Response Time to Ultra Fast for the best overdrive performance with fast pixel response times and negligible overshoot ghosting. Added the Review by Tom's Hardware to my Best Reviewed Flicker Free 27" 4-5K AHVA/IPS/PLS buying guide. The Acer XB273K has very accurate accurate (SDR/sRGB & HDR color modes; color controls are locked when HDR is enabled) 144hz (achievable only when connected with 2x Displayport cables) 3840x2160 or 4K matte wide gamut AUO HAVA panel which can cover 87.65% of the DCI-P3 color space, provide 460cdmn/2 peak brightness, and can fully cover the sRGB color space to prevent over-saturation when the sRGB mode is selected. It has a fully adjustable stand, a monitor hood, 1x Displayport, 1x HDMI 2.0, 4x USB 3.0, 3.5mm Audio Out and Nvidia G-Sync. Reading the monitors included manual and/or Tom's Hardware's review is necessary in order to properly understand how to use a wide gamut monitor, and fully make use of all its features such as the 384 zone local dimming or dynamic contrast, and prevent wide gamut color over-saturation. Added the Reviews by PC Monitors and Review by TFT Central to my Best Reviewed Flicker Free 27" 1440p AHVA/IPS/PLS buying guide. Fully adjustable, matte, 2560x1440 PLS (LTM270DL11) with Displayport In & Out (for Daisy Chaining), HDMI, 4x USB 3.0, 3.5mm Audio Out and accurate out-of-the-box colors in the default Standard mode aside from the color temperature of the unit TFT Central tested which is too warm at 5653k (preset orange and red dominance). The U2719D has a medium matte coating which looks slightly grainy/sparkly when viewing light colors and white according to PC Monitors. Added the Review by PRAD to my Best Reviewed Flicker Free 32" 4K AHVA/IPS/PLS buying guide. Fully adjustable matte 3840x2160 LG AH-IPS with AMD Free-Sync (40-60hz) Displayport, hardware calibration (requires compatible colorimeter), HDMI 2.0, HDR Color*, Thunderbolt, 2x USB 3.0, USB-C. The LG needs to be hardware calibrated to be truly competitive, as well as operate as well as possible. *Belgium Hardware was able to achieve 90% DCI-P3 (HDR) color space coverage through hardware calibrate with an accurate colorimeter (X-Rite i1 Spectrophometer) while Rtings unit was limited to 76% DCI-P3 which is achievable by standard or non-wide gamut panels, and basically fake HDR. The unit PRAD tested uses high khz PWM (non detect-able flicker), high DCI-P3 color space coverage (91% before calibration and 95% after) and decent preset color accuracy. The preset color accuracy of the unit Rtings tested is mediocre for the price, and it uses motion clarity ruining 240hz LED PWM Dimming or flicker, which makes it a joke. Matte, fully adjustable 10 bit (8 bit +FRC) 3840x2160 AH-IPS panel with Displayport, 2x HDMI 2.0, mini Displayport, 4x USB 3.0 and 3.5mm Audio In & Out. The VP3268-4K is very accurate, and supports hardware calibration with a compatible accurate colorimeter such as the X-Rite i1 Display Pro and has a 14 bit 3d LUT which reduces banding and preserves the quality of gradients when calibrated. The overdrive (Response Time) is set to Standard, but can be improved without adding overshoot ghosting by selecting the Advanced setting. Added the Review by Les Numeriques (unsure if AUO AHVA or Innolux IPS panel) to my Best Reviewed Flicker Free 144-165hz 1440p Monitors and Best Reviewed Flicker Free 27" 1440p AHVA/IPS/PLS buying guides. The Acer uses a fake bezel/frame-less (it has an inner black bezel which reduces the perceived black depth versus a grey bezel) 144hz AUO M270DAN02 AHVA panel (advertised as IPS) with Displayport (Free-Sync + 40-144hz range), HDMI 1.4, HDMI 2.0 (Free-Sync + 40-144hz range) and 3.5mm Audio Out. It supports AMD Free-Sync (40-144hz range), 120hz back-light strobing (named VRB=Visual Boost Response, can completely cover the sRGB color space without significant over or under-saturation, and has quite accurate color presets (sRGB mode is a bit better and reduces the brightness to 153cdm/2), above average contrast (1100:1 vs 800:1 for AHVA/IPS/PLS and TN), and the typical balanced preset Acer overdrive (OD: Normal) with very fast pixel response times and minimal to no overshoot ghosting. Added the Review by Techspot to my Best Reviewed Flicker Free 144hz 1440p Monitors buying guide. Fully adjustable, curved, matte 144hz 2560x1440 VA panel with Dual-Link DVI, Displayport, HDMI 2.0 and 3.5mm Audio Out. The MAG27CQ has a strong preset blue dominance, and very low preset gamma (1.89 average) resulting in very washed out image quality, which is unrivaled, assuming awfulness is the goal. Curved semi-wide gamut (22% over-saturation or 122% sRGB) matte 2560x1440 144hz VA panel with AMD Free-Sync (48-144hz range) 2x USB 3.0, Displayport, 2x HDMI 2.0, 2x USB 3.0, a height adjustable stand and a fake frame-less casing with a perceived black depth reducing inner black bezel. It's pretty accurate aside from the gamma which is a bit high in the 0-10% white range resulting in a bit of black crush. The Pro mode is the most accurate color preset. The MPG27CQ is worth paying more for to those who do not own accurate colorimeters since the MPG27CQ offers good preset color accuracy while the MAG27CQ is awful. Fully adjust-able matte 144hz 1920x1080 AUO TN panel with AMD Free-Sync (48-144hz from), Displayport, 2x HDMI (120hz), 2x USB 3.0, and 3.5mm Audio Out. The Viewsonic has accurate 60hz image quality, but suffers from a significant gamma drop (60hz 2.3 to 1.9 at 144hz), and loss of color and shade accuracy and vibrancy when set to 144hz. Setting the Gamma to 2.6, and setting the Gaming Settings to Custom 1 and 2 (best) improve the 144hz gamma. The Viewsonic has negligible input lag, balanced overdrive (fast pixel response times and minimal overshoot) with the Faster Response Time OD setting, but has a perceived black depth decreasing matte black bezel versus the XG2401's perceived black depth increasing matte grey bezel. Matte 144hz 2560x1440 semi-wide gamut and 8 bit AUO TN panel with low preset gamma (2.04 average), a preset blue dominance and wide gamut color over-saturation of non-HDR content since the Viotek lacks an SDR color space (HDTV/REC 709 or sRGB) emulation mode. Added the VG270UP AHVA Panel Review by =DEAD= and the VG270UP Innolux IPS Panel Review by =DEAD= to my Best Reviewed Flicker Free 144-165hz 1440p Monitors and Best Reviewed Flicker Free 27" 1440p AHVA/IPS/PLS buying guides. The reviews by =DEAD= review contains photos of the Test UFO Ghosting test which proves that the AUO AHVA panel is faster (OD Normal) out of the box, has a useful Extreme overdrive setting with only a bit of overshoot ghosting, which is noted in this section of the review. The AUO AHVA panel has significantly more accurate preset color accuracy, especially the gamma since the Innolux IPS has low gamma (scroll down to see this chart) while the AUO AHVA panel has nearly perfect 2.2 preset gamma and 93% DCI-P3 color space coverage for games with HDR support. The Innolux panel does use a semi-wide gamut panel which over-saturates the colors of SDR (HDTV/REC 709 & sRGB) content out of the box, but does have an sRGB mode to prevent the 34% over-saturation, as well as offer proper 2.2-ish gamma; AHVA vs IPS sRGB Color Space comparisons. The last significant difference is the AUO AHVA panel suffers from white glow when viewing black while the Innolux IPS suffers from brownish-red glow; compare multiple photos: AUO AHVA vs Innolux IPS. The AUO AHVA panel is better since it has superior preset color accuracy or image quality for the majority of consumer content which use SDR color spaces (HDTV/REC 709 & sRGB), and has faster pixel response times and less overshoot ghosting than the Innolux panel. The Gigabyte AORUS AD27QD has similar overdrive, but is significantly more accurate than the Innolux VG270UP, and has a height adjustable stand which makes it worth the extra money since height adjustable stands cost at least 50$ US, and the 150$ US X-rite Colormunki is the cheapest accurate colorimeter. Curved 2560x1440 144hz semi-wide gamut and matte VA panel with Nvidia compatible (requires 10 series or better) AMD Free-Sync, 2x Displayport, HDMI 1.4 (75hz 2560x1440), HDMI 2.0 (144hz & Free-Sync support), HDR 400, RGB Lighting, 2x USB 3.0, VGA and 3.5mm Audio In & Out. The Game Mode 1 and 2 presets offer the most accurate colors, but over-saturate some by over 20% since the 273QCX uses a semi-wide gamut panel. AOC included a fairly accurate sRGB mode which prevents over-saturation, but locks the color controls. The AOC claims HDR400 support, but lacks a full 10 bit and wide gamut (91.3% DCI-P3 coverage) panel with 1000cdm/2 or nit brightness (it can output 400cdm/2 as advertised) and local dimming to provide real HDR, which is to be expected from monitors under 1300$ US. The 273QCX has a very low 8ms delay (SMT Tool measurement) and fast pixel response times (for a VA panel) without obvious overshoot ghosting. Added the Review By PC Mag to my Best Reviewed Flicker Free 32" 4K AHVA/IPS/PLS buying guide. Fully adjustable matte, wide gamut (98% Adobe RGB color space coverage after calibration) 10 bit 3840x2160 AH-IPS with a 14 bit 3D LUT, Displayport, Hardware Calbiration (requires compatible colorimeter; the X-Rite i1 Display Pro & i1 Pro 2 are the best compatible colorimeters), HDMI 2.0, mini-Displayport, monitor hood, perceived black depth increasing matte grey bezel, SD Card Reader, 2x USB 3.0 and 3.5mm Audio In. The BenQ SW320 is preset to the Adobe RGB mode which vastly over-saturations the colors of SDR (HDTV/REC 709 & sRGB) color spaces unless the monitor is used with programs which support color management such as Photoshop. The SW320 has negigble input lag (2.3ms top screen Leo Bodnar device measurement) and passable (but not great) overdrive (AMA Off; the preset High setting causes obvious overshoot ghosting) for media viewing and casual gaming. 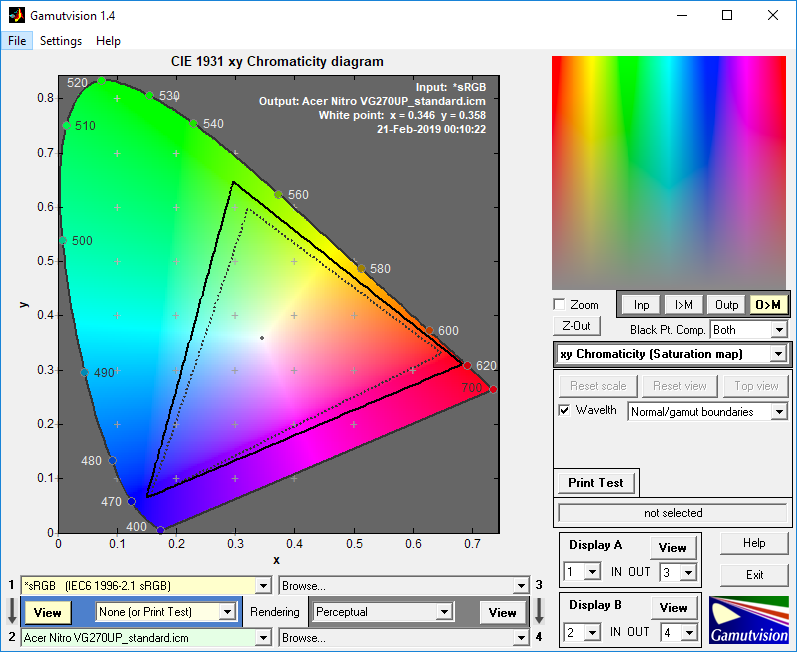 The SW320 is a waste of money if not bought to make use of its Adobe RGB color space coverage and hardware calibration which requires a compatible, and ideally accurate colorometer such as the X-Rite i1 Display Pro & i1 Pro 2. though the hardware calibration BenQ offers is not as good as the programs offered by Eizo and NEC according to PRAD. Added the Review by Rtings to my Best Reviewed Flicker Free 144-165hz 1440p Monitors and Best Reviewed Flicker Free 27" 1440p AHVA/IPS/PLS buying guides. This is the third very accurate Gigabyte AD271QD tested, and a store bought unit which makes the accuracy consistency even more impressive, and humiliating for the AUO AHVA G-Sync monitors which used to cost 700-950$ US, and were quite inconsistent, especially in the case of the AOC AG271QG and Asus PG279Q. The Acer XB271HU was consistently mediocre (for the price) while the Viewsonic XG2703-GS was consistently good. The Gigabyte is the most consistently great 144hz AHVA/IPS panel preset color accuracy wise along with the vastly more expensive Eizo FS2735 and discontinued Viewsonic XG2703-GS. While not stated below or on my site, I think the AD271QD's overdrive performance is unimpressive due to the increased overshoot ghosting it suffers from versus the Acer XB21HU, and 1-3ms slower pixel response times. All of the 144-165hz AUO AHVA panels except for the Acer XB271HU offered great 60hz overdrive; the Gigabyte suffers from more overshoot than the Acer which makes the Gigabyte the worst option for console and PC gaming. Rtings rated the Gigabyte's overdrive 9.5/10 which surprised me since they rated it higher than the XB271HU and PG279QZ, and because Belgium Hardware measured 1-3ms slower pixel response times and 5% more overshoot ghosting than the Acer XB271HU. I'm not sure what to make of these differences except that both reviews vastly conflict with some commenters on Reddit. Added the Review by TECHSPOT to my Best Reviewed Flicker Free 27" 4-5K AHVA/IPS/PLS buying guide. Matte 4K AHVA panel with 98hz (8 Bit +FRC / 10 bit HDR 4:4:4), Nvidia G-Sync, height adjustable stand, 4x USB 3.0, local dimming and true HDR color. Proper color (YcBcr 4:4:4) is only supported up to 98hz. Image quality is degraded at 99-144hz. Read my X27 versus PG27UQ comparison here. Added the Review by Sweclockers and to my Best Reviewed Flicker Free 27" 4-5K AHVA/IPS/PLS buying guide. Curved (1800R) matte 2560x1440 144hz semi-wide gamut fake bezel/frame-less VA panel with back-light strobing (120hz MBR), 2x Displayport, Free-Sync (48-144hz range over Displayport & HDMI) 2x HDMI 2.0, VGA, 4x USB 3.0, 3.255 Audio In and a fully adjustable stand. The AOC has low preset gamma (1.9 average) resulting in washed out image quality which can be vastly improved by setting the gamma to 3 which increases the gamma to 2.2 which provides proper saturation of colors and shades. The AOC has an sRGB mode to prevent the wide gamut over-saturation of non HDR (DCI-P3) content, but suffers form a present green tint and has locked color controls. The Medium overdrive setting is best for 60hz while Strong is the best for 144hz. The Strong overdrive setting suffers from a bit more smearing than the faster Samsung C27HG70 which has a perceived black depth increasing matte grey bezel. The AOC is G-Sync compatible, but it flickers and the overdrive setting is locked to Off which reduces the pixel response times and causes very obvious smearing. Added the Review by Sweclockers and the Review by TECHSPOT to my Best Reviewed Flicker Free 27" 4-5K AHVA/IPS/PLS buying guide. Added the Review by =DEAD= to my Best Reviewed Flicker Free 144-165hz 1440p Monitors and Best Reviewed Flicker Free 27" 1440p AHVA/IPS/PLS buying guides. Very accurate and fully adjustable matte 2560x1440 144hz semi-wide gamut Innolux IPS with Displayport, 2x HDMI 2.0. RGB Lighting, 2x USB 3.0 and 3.5mm Audio In & Out. Curved semi-wide gamut matte 2560x1440 144hz VA panel with AMD Free-Sync (48-144hz range) 2x USB 3.0, Displayport, 2x HDMI 2.0, 2x USB 3.0, a height adjustable stand and a fake frame-less casing with a perceived black depth reducing inner black bezel. It's pretty accurate aside from the gamma which is a bit high in the 0-10% white range resulting in a bit of black crush. The Pro mode is the most accurate color preset. The MPG27CQ is worth paying more for to those who do not own accurate colorimeters since the MPG27CQ offers good preset color accuracy while the MAG27CQ is awful. Added the Review by Playwares to my Best Reviewed Flicker Free 144hz 1080p Monitors buying guides. Very accurate, curved, matte, 144hz 1920x1080 semi-wide gamut VA panel with Displayport (144hz), Free-Sync (48-144hz) 2x HDMI (120hz) and 2x USB 2.0 ports. The MAG271C is pretty much the same as the AOC C27G1. Added the Review by Sweclockers to my Best Reviewed Flicker Free 144hz 1440p Monitors buying guide. Curved matte 2560x1440 144hz VA panel with AMD Free-Sync, back-light strobing and a perceived black depth increasing matte grey bezel. It uses LED PWM Dimming or Flicker when the brightness is set below 70/100 which TFT Central measured to be a very bright 250cdm/2. Back-light strobing is activated when the Response Time setting is switched from Standard to Faster, and Fastest. The Samsung is fairly accurate, but Sweclockers unit came with high preset gamma which averages around 2.36 which causes black crush or loss of detail in dark scenes. Changing the gamma to mode 2 brings the gamma closer to averaging around 2.2 and increases the accuracy, as well as reduces black crush. I was informed about the fact that the U2518D suffers from screen tearing when connected to the PS4. Here's video proof and a post about the issue in the Dell forums. Best Reviewed Flicker Free 25" 1440p AHVA/IPS/PLS buying guide. Added the Review by PC Monitors to my Best Reviewed Flicker Free 27" 4-5K AHVA/IPS/PLS buying guide. The Acer XB273K has very accurate Standard mode preset (SDR/sRGB & HDR color modes; color controls are locked when HDR is enabled), 144hz (compressed 4:2:2 YCbCr422 color signal called instead of 8 bit 4:4:4 YCbCr444 @120hz and 10 bit 4:4:4 YCbCr444 @98hz), 3840x2160 or 4K matte wide gamut AUO HAVA panel which can cover 87.65% of the DCI-P3 color space, provide 460cdmn/2 peak brightness, and can fully cover the sRGB color space to prevent over-saturation when the sRGB mode is selected. It has a fully adjustable stand, a monitor hood, 1x Displayport, 1x HDMI 2.0, 4x USB 3.0, 3.5mm Audio Out and Nvidia G-Sync. Reading the monitors included manual and/or PC Monitors and Tom's Hardware's review is necessary in order to properly understand how to use a wide gamut monitor, and fully make use of all its features such as the back-light dimming (SDR Variable Back Light), and sRGB mode (SDR Colors sRGB) to prevent wide gamut color over-saturation. Added the Review by IBXT to my Best Reviewed Flicker Free 27" 4-5K AHVA/IPS/PLS buying guide. Added the Measurements and Review by Belgium Hardware, and the Review by PRAD (<700:1 contrast) to my Best Reviewed Flicker Free 144hz 1440p Monitors buying guide. Semi-wide gamut, curved, matte 165hz 2560x1440 AUO TN with Nvida G-Sync (30-165hz range), with a fully adjustable stand, Displayport, HDMI and a medium matte coating which is normal for 1440p TN panels. The AOC has fairly linear gamma and a semi-wide gamut panel which slightly over-saturates colors, but has strong preset green tint (Belgium Hardware) and may come with low contrast (PRAD). Added the Measurements and Review by Belgium Hardware, and the Review by PRAD to my Best Reviewed Flicker Free 144hz 1440p Monitors buying guide. Curved (1800R) matte 2560x1440 144hz semi-wide gamut fake bezel/frame-less VA panel with back-light strobing (120hz MBR), 2x Displayport, Free-Sync (48-144hz range over Displayport & HDMI) 2x HDMI 2.0, VGA, 4x USB 3.0, 3.55mm Audio In and a fully adjustable stand. The AOC Belgium Hardware tested came with proper preset gamma while the unit PC Monitors (lowest preset gamma) and PRAD tested came with low preset gamma resulting in washed out image quality which can be vastly improved by setting the Gamma to 3 which increases the gamma to 2.2 which provides proper saturation of colors and shades. The AOC has an sRGB mode to prevent the wide gamut over-saturation of non HDR (DCI-P3) content, but suffers form a present green tint and has locked color controls. The Medium overdrive setting is best for 60hz while Strong is the best for 144hz. The Strong overdrive setting suffers from a bit more smearing than the faster Samsung C27HG70 which has a perceived black depth increasing matte grey bezel. The AOC is G-Sync compatible, but it flickers and the overdrive setting is locked to Off which reduces the pixel response times and causes very obvious smearing. Added the Review by PRAD to my Best Reviewed Flicker Free 27" 1080p IPS/PLS Monitors and Best Reviewed Flicker Free 144hz 1080p Monitors buying guides. Added the Review by NCX to my Best Reviewed Flicker Free 24-25" 1080p IPS/PLS Monitors buying guide. Fairly accurate 1920x1080 almost-glossy or low haze coated LG AH-IPS with AMD Free-Sync, native 75hz, 2x HDMI and 1x VGA. Fully adjustable matte and wide gamut 5120x2880 LG AH-IPS panel with a perceived black depth increasing matte grey bezel, a webcam and 3x USB-C. It has excellent preset RGB balance accuracy, but slightly too high preset gamma and the Adobe RGB mode RGB balance is worse. 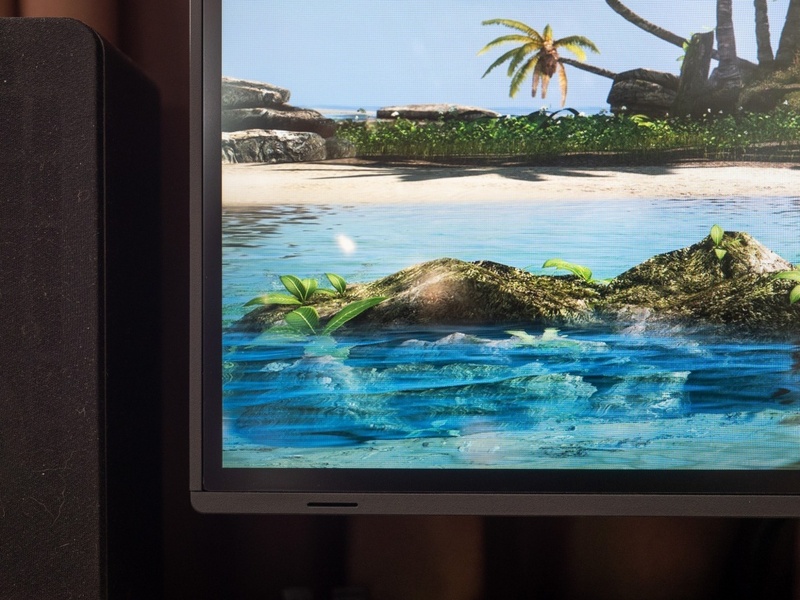 Added the Review by PRAD to my Best Reviewed Flicker Free 1920x1200 IPS monitors buying guide. The Eizo EV2457-BK uses a matte 1920x1200 LH AH-IPS panel with a fully adjustable stand, Displayport In & Out, Duak-Link DVI, HDMI, 4x USB 3.1 and 3.5mm Audio In & Out ports. The EV2457-BK can scale external/non-PC 16:9 signals correctly, is fairly accurate and fast pixel response time wise (Standard overdrive setting), but has a 12ms delay according to PRAD's oscilloscope measurements. Fully adjustable, matte 31.5" 4K LG AH-IPS with Displayport, 2x HDMI 2.0, USB-C, 2x USB 3.1 and 3.5mm Audio In & Out. The Eizo is very accurate once the brightness sensor (EcoView Optmizer) which reduces the color accuracy and changes the brightness automatically. =DEAD= does not measure input lag and the Eizo has a fake bezel or frame-less casing with a perceived black depth reducing inner black bezel. Added the Review by IBXT to my Best Reviewed Flicker Free 144-165hz 1440p Monitors and Best Reviewed Flicker Free 27" 1440p AHVA/IPS/PLS buying guides. Very accurate and fully adjustable matte 2560x1440 144hz semi-wide gamut Innolux IPS with Displayport, 2x HDMI 2.0. RGB Lighting, 2x USB 3.0 and 3.5mm Audio In & Out. IBXT's review is the fifth review to confirm that the Gigabyte is consistently very accurate, and that the Speed overdrive setting causes obvious overshoot. Added the Review by Tom's Hardware and to my Best Reviewed Flicker Free 27" 4-5K AHVA/IPS/PLS buying guide. 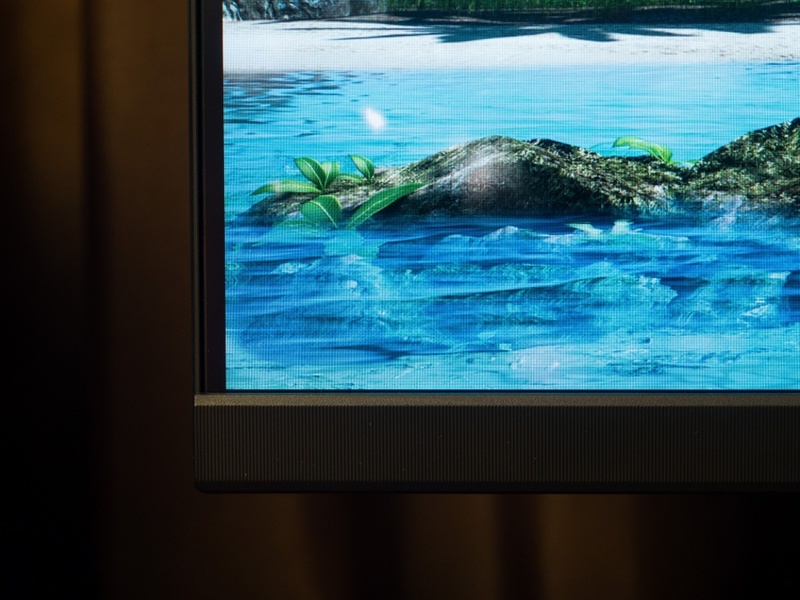 The Acer XV273K has an accurate 144hz (achievable only when connected with 2x Displayport cables) 3840x2160 or 4K matte wide gamut AUO AHVA panel which can cover 97% of the DCI-P3 color space, and can fully cover the sRGB color space to prevent over-saturation when the sRGB mode is available, but doing so locks the color controls. It has a fully adjustable stand, a monitor hood, 2x Displayport, 2x HDMI 2.0,4x USB 3.0 and a 3.5mm Audio Out. Added the Review by Playwares and to my Best Reviewed Flicker Free 27" 4-5K AHVA/IPS/PLS buying guide. Matte 3840x2160 LG AH-IPS panel with Displayport, Dual-Link DVI (3840x2160 @30hz), HDMI 2.0, VGA, 4x USB 3.0 and 3.5mm In & Out. The preset gamma (Mode 1) has low preset gamma of 2.05 which results in the monitor being washed out. Setting the Gamma to Mode 2 increases the accuracy and gamma average to 2.26 resulting in good image quality. It has a 22ms delay (measured with the SMT Tool) versus <8ms for most competitors. Added the Review by Playwares to my Best Reviewed Flicker 240hz TN Panels buying guide. Matte 1920x1080 240hz with a fully adjustable stand, Nvidia G-Sync (30-240hz), 144hz ULMB (back-light strobing) Displayport, HDMI (60hz), 3x USB 31 and 3.5mm Audio Out. The default Gaming mode offers fairly accurate color preset performance. It has negligible input lag (3ms measured with the SMT Tool) and very fast pixel response times with minimal overshoot when the Fast Response Time setting is used. Added the Review by PC Monitors and to my Best Reviewed Flicker Free 27" 4-5K AHVA/IPS/PLS buying guide. The Philips uses a very accurate 4K fake bezel or frame-less LG AH-IPS panel with Displayport, 2x HDMI 2.0 and a 3.5mm Audio Out jack. Set the overdrive (Response Time) to Faster for the best performance. The unit PC Monitors tested is slightly less accurate than the other two, but still very accurate, especially when considering the price. Added the Review by =DEAD= and Rtings to my Best Reviewed Flicker Free 144-165hz 1440p Monitors buying guides. Non-curved and non-semi-wide gamut matte 144hz 2560x1440 Samsung VA panel with HDMI, mini-Displayport and USB 2.0. The unit =DEAD= tested is fairly accurate aside from the low preset gamma which can be improved by selected Gamma Mode 2. It suffers from dark scene banding, but it is not nearly as bad as the Dell S2417DG, S2716DG and ViewSonic XG2402. It has high input lag at 60hz (25ms; Rtings measurement) for a monitor.